SCOOP THAT BLOOP: Lobes Talk. My hair is getting longer these days (or longer than it has been the past two years). When it comes to my hair, I'm "going for distance. ...Going for speed". I get slightly impatient these days, checking my hair every few minutes rather than every few weeks... Irritating, I know. Still, do a little jig in my honor! Yay for long-ish hair! This past summer, I attended "Vintage Days" at Fresno State University, a huge blowout bash full of vendors and artists, games and noise, contests and music, blah blah blah. At one small booth, I noticed a collection of wooden hair forks that I found particularly attractive. I purchased the one designated for hair that might come close to the thickness of mine - not an easy feat - and took it home without trying it on. Hahahaa..... Yeah, my hair was too short to use said fork until last month. So the fork sat in my drawer until Christmas time when I found it during one of my "look at me, I'm just like my clean-freak mother" moments, tearing through every nook and cranny in my allotted sector of the condo armed to the teeth with sponges and disinfectant. The fork came with a diagram of a few fancy shmancy ways to "shrew" the "do". Unfortunately, on the day I brought the fork home, I was once again in that "motherly cleaning" mode, in which it is my immovable policy to get rid of every single item that could possibly be deemed unnecessary. I promply fulfilled my duty as a Black daughter by tossing the purchase baggy, the receipt, and the instructional diagrams into the trash bin. Hmmm... do I do this every time I shop? Something environmental is stirring within me. I think Daughter-Laura and Grown-Up-Attempting-Environmentalist-Laura need to sit down to have a little chat. The result is simple, elegant, and easy to fix should it ever fall out. It works for now. "What has this got to do with lobes talking, Laura?" Still don't see the connection to lobes? that's probably because there isn't one. I just felt like telling the story of my lovely hair and new/old hair fork. Hooray. I have always had this bump on the back of my head. Always a lump. Perhaps the remains of the dead fetus twin I resorbed in the womb? hehehe..... (hopefully you "Office" and "bigfatgreekwedding" fans caught that). Seriously, though. I always thought I was a freak. I was convinced that I had been dropped on my head as a child, or that my soft spot had never hardened properly. Immediately above the big beak-like lump on the back of my head, there is a flat, sensitive surface that slants upward at something like a terribly unattractive 45 degree angle, rather that a nice, rounded "back of skull" as found on non-freaks. About 4 years ago, I began to realize that I am kinda sorta a little bit maybe smart. In my brilliance, the thought crossed my mind that perhaps this lump was the result of my brain growing incredibly fast in one direction, too large for an average skull. Accompanied by irregular sleep positions, this could be a rudimentary explanation for my abnormal skull shape. Seriously. I thought this. With all my anthropological fascination and study, this is what I came up with. So much for smart. Ha! Oh look, a relationship to the first half of this post! After an HOUR of online-searching for every lumpy-head-study phrase I could think of, I FINALLY found a wikipedia (oh so reliable...) entry on PHRENOLOGY! 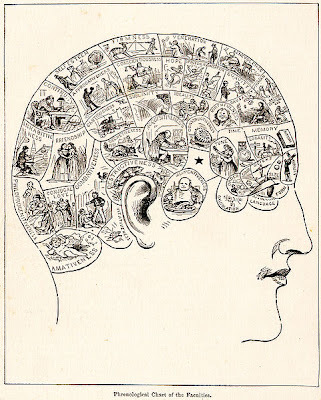 Phrenology- long since labeled a "defunct" field of study- was the psuedo-science in which the "reading" of the bumps on one's skull was used to discover one's personality traits. Not quite fortune-telling. Not quite a real science. But enough correlations were found between certain characteristics of skull forms and personality traits that charts were drawn, sculptures made, and careful instructions laid out. The lump on the back of my head is not as rare and found-only-in-freaks as I originally thought. It is simply an over-developed Occipital Lobe. The Occiput is the hole in the base of the primate skull in which the peak of the spine is held, allowing the skull to rest balanced atop the control post of the body, manipulated and held by muscle and tissue. Guess where I learned this. Guess. Dance Class. Oh yeah. Dance class, baby. 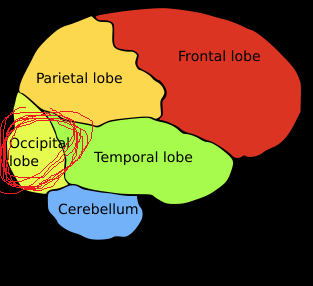 The occipital lobe is the visual processing portion of the brain, also known to control and contribute to spatial processing, color discrimination, and motion perception. Hello. If most of that didn't sound like pure dance terminology to you, read it again and take a dance class. ANY dance class. I was totally engineered to be a dancer, dudes! hahahahahahaaa..... Well, that's the story I'll stick to, anyway. Back to Phrenology. In Phrenology, an enlarged occipital lobe or bump in such an area signifies strength in Philoprogenitivness. .....? My sentiments exactly. "prolific" writer. Whether they are referring to my obvious thirst for learning as I write and explore or to my lengthy delivery of copious amounts of unnecessary and nearly irrelevant information, I have not yet decided. But the correllation is interesting, no? Other formations on my head suggest that I am prone to destructiveness, have low self-esteem and little sense of continuity (the slope in the back of my head should be a nice, hefty curved compartment where apparenlty all my self-esteem and continuity WOULD have been stored! haha! ), a serious affinity for conjugal love... no comment... prone to develop close friendships, have a hefty appetite, a gift for musical tune, a good understanding of language in general, No sense of time or proportion, strong senses of ideality and sublimity, hope, spirituality, and imitation, just about a complete lack of all things suave, and a pretty decent memory. Anything I left out of that ugly sentence was left out because I simply didn't understand what my head bumps were telling me, pro or con. The funny thing is, if you know me well, that is... ME. It really does describe me exactly, with the exception of maybe the continuity part. I disagree with that whole-heartedly. Hmmmm. Interesting. Those of you who made it through this insanely lengthy post now have the joy of trying it on for size!!!! Let's all play the phrenology game! Click on the mapped head images above, enlarge them, and give yourself a good head massage. Tell me what Phrenologists would say of you! First, some of us may throw things away, but they are always thrown in the correct recycling bin. Next, my lobes keep changing their mind. My head shape is constantly changing. Could it be that the content is jello??? Laura m'dear, had you asked me about so much as "the skull-bumpy thingy" I would have supplied you with the word. ;p My classes covered it last summer. Very cool that your dance classes hit it up too. 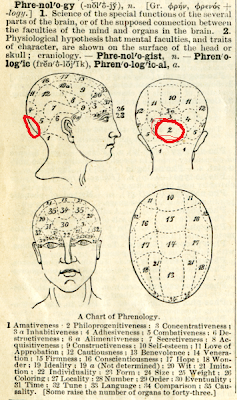 Your phrenology post was awesome. Some time when I'm awake instead of just typing, I'll try it out. I am totally rubbing all over my skull right now and I got... NOTHING. No bumps. Nothing to signify what a freaking genius I am. What up with that? If I look at the head maps will smooth bumpless/dentless head mean something other than boring and predictable? I hope so. In the meantime, I would like to see you go Sinead. This lump is too valuable to be hidden under all that hair. These plates have been energised by the UNIVERSAL FREE ENERGY & CAN BE USED LIFE LONG for a multiple of uses. ie PAIN, STRESS, FATIGUE, DEPRESSION. 1-Protects from Electro Magnetic Radiation--These Plates are being used world over as the only Natural Tool to provide protection from ELECTRO MAGNETIC RADIATION, which CAUSES CANCER. 2-First Aid Kit--It relieves any kind of pain, cut or burns within 20 minutes.People suffering from :Spinal Injuries, Bachache,Computer Related Injuries, Migraine, Spondalities, Headache, Toothache, Sprains, Stress, Fatigue, Depression,Eppilepsy & Mental Problems. For pregnant mothers it controls NAUSEA & VOMITING. Place the plate in the forehead for 20 minutes twice a day.See improvement from day one. To check its authencity place the plate on any painful area of the body. It relieves the pain in 5 to 20 minutes. I sometimes fall over. But it's ok. I'm a biped.